For once, I didn't have anything planned last night, so my husband arranged for us to go to dinner and a free movie premiere with a couple we know. They'd received the movie passes while attending a performance of what they described as "the most awful Journey tribute band ever." Oddly, the name of the film wasn't printed on the passes, but I could tell what it was once I saw the artwork. The movie was The Rocker, starring Rainn Wilson, a.k.a. Dwight from "The Office." My husband and I had seen the trailer, so we were already looking forward to it. We noticed a bunch of drumsticks next to the theater door as we walked in, and the PR rep said they were for the movie's MySpace friends. Before the movie started, it was announced that there would be additional free premiere viewing opportunities between now and the opening date of July 30th for MySpace friends and Facebook fans. I thought that was a pretty impressive commitment to social media promotion. The movie has a great cast that includes Christina Applegate, Jeff Garlin, Howard Hesseman, Jane Lynch and a bunch of young 'uns who are probably very popular with people a couple of generations behind me. There's also a scene with Demetri Martin as a video director that makes me laugh to myself just thinking of it. If you like rock comedies, you should enjoy this one. It contains some nice homages to This Is Spinal Tap, Almost Famous, That Thing You Do and other notable rock band movies that preceded it. The only annoying thing about the premiere experience was being required to surrender my cell phone before I entered the theater. I've had that happen at premieres before, but usually there's some kind of claim ticket involved. This time around, I felt lucky to get my phone back at all afterward as members of the audience basically had to pick through the bagged phones and find their own. Bad, bad planning. Can you believe we do this every few years? I think we could have filled it to the top if we'd persisted for another week, but there's a limit to how long I'm willing to have an unsightly dumpster blocking half of our driveway. It really made me think about the unnecessary things we buy. I hope it'll make me pause the next time I start to reach for something stupid on a store shelf. We also have five trash bags stuffed with clothes and housewares that will be going out for a charity pickup on Friday. After that, all I need to do is file some stuff in my home office and I'll be done. Done, I say! The feng shui is so improved in this place, I could swear there are dragons doing cartwheels in every room. We like that - it entertains the cats. I need to spend the morning re-dyeing the blue highlights in my hair, so I don't have time for a full post. 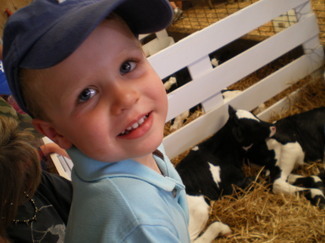 Thus, here's a photo from Saturday of my nephew looking at calves. It was a day filled with delicious snacks and fun activities. For a three-year-old, my nephew did very well with all the waiting in lines. Thanks for a great day, kids! Where did I hear that George Carlin had died? Twitter. How did I find out that the Phoenix lander had found ice on Mars? Twitter again. Twitter is where I hear about all kinds of interesting things these days. I also use it to follow my local weather and get wind of online PR debacles as they're happening. I first started cutting back on TV watching during the writers' strike. Then our ancient TiVo died. By the time it was replaced with a notably inferior Time-Warner DVR, I was having trouble coming up with more than a handful of shows I wanted to program in. Last week, the new DVR stopped working and I haven't turned on the TV again since I noticed. Did we try to fix it? Nah, not yet. We've been too busy making music, hanging out with friends and cleaning the house. In that time, I also caught up on all my RSS feeds, read two books, spent an afternoon on a dairy farm with my niece and nephew, and went out boating and swimming in a lake. Don't get me wrong - I'm certainly not giving up television. In fact, I want to be sure we have a working DVR by the time Burn Notice comes back on, and I also need to catch up on episodes of Kathy Griffin. Still, TV plays much less of a role in my life now than it ever has. I spend most of my free time online or, you know, actually doing things. I have a strong feeling that this trend is going to continue. I can envision eventually watching all my favorite shows online and dropping our cable TV subscription altogether. I'm sitting in my office with all the windows open and it's so wonderful that I'd be tempted to stay here all day if I didn't have so much fun stuff planned. First on today's agenda, after a quick meetup at Panera so XO's daughter can buy my old phone, is a trip to my sister's house to pick up my niece and nephew. 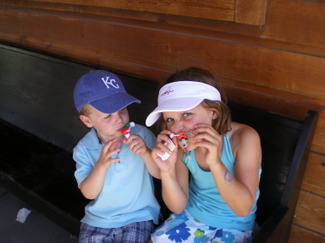 We're taking a road trip to Shatto Dairy for their Family Day at the Farm. I'll be taking lots of photos. After that, there was talk of going out to Longview Lake on my brother-in-law's boat. I'm not a fan of exposing my pallid flesh to UV rays, but I'll bring a swimsuit and sunscreen just in case I decide to go. Lake water is much friendlier than pool water on the hard-to-maintain midnight blue highlights in my hair, so I kind of hate to pass up an opportunity to swim that isn't going to ruin my color. On Sunday, the cover band has its first practice in several weeks. We have yet another lead guitarist coming with 10+ songs prepared, so we're hoping to stay on track. I'm going to grill hot dogs and hamburgers to feed everyone in the hope of making it as long a practice and meeting as possible. In between scheduled activities, the Great House Cleanout continues. I decided to keep the dumpster for another week so as not to miss the opportunity to clean out down to the level of the junk drawers in the kitchen. We've lined up our usual construction guy to start the guest room remodel soon, so that room is up for merciless de-junking as well. So that's my weekend, to the best of my foreknowledge. What are you planning? I'm spared the necessity of writing something new this morning because you can find me elsewhere in the blogosphere today. For starters, one of my flea market photos made it onto The "Blog" of "Unnecessary" Quotation Marks. Then there's my new gig at MidLifeBloggers, writing about continuing my rock and roll hobby despite the fact that I certainly ain't getting any younger. In case you're questioning the "midlife" part (and if you are, thank you so very much! ), it's probably because I've never been particularly forthcoming about my age here. When I started the blog, I described myself as "thirty-something" on my About page. Then I turned forty and quietly removed the inaccurate copy. Denial? Oh, a tad. However, I'll be turning 41 in a few weeks and I'm tired of being evasive about it. I never plan on actually growing up, so what difference does the number make? Therefore, check out all of the great midlife bloggers that my friend ByJane has brought together and I'll get back to writing new stuff next week. Hey, how about a meme? I lifted this one from Donna. Accent: My mother put in a lot of time making sure I didn't pick up a Missouri accent from my peers. Thus, I sound like the rest of the South Dakotans in the family. Breakfast or no breakfast: Breakfast, without fail! Chore I don’t care for: Cat box cleaning, which is why I just bought one of these. I'll provide a full report once the cats have gotten used to it. Handbag I carry most often: I'm currently carrying a Coach bag that my sister gave me. My favorite thing about it is that she took off and threw away the Coach tag. Insomnia: I can fall asleep at the drop of a hat, but sometimes I wake up earlier than I'd like and can't go back to sleep. Time I wake up: Between 5:30 and 6:30 a.m.
My husband and I are still living in our "starter house" after 13 years. It's plenty big enough for two people and some cats, so we decided some time ago that we're here to stay. Now that the memory of the noise, dust and inconvenience has faded, I'm ready to tackle another room. Our guest room is that room - the one where the door stays closed all the time and junk piles up until you can barely walk in. The last time it got any real use was when my husband's sister lived with us in the late '90s. That's also why it has purple carpeting (she was 15 when she moved in). We'll get a futon or daybed and set up the room as a secondary TV room and guest room. That way, when kids come over or we have a rare overnight guest, there will be a comfortable place for them. Once we have the extra pantry space, I can get rid of the baker's rack in the kitchen and put a breakfast nook in its place. Then we could finally have meals that don't involve plates on our laps in front of the TV. Now I just need to find someone to DO all this work. When I ordered the dumpster last week, the guy told me that they'd leave it for seven days. Don't ask me why I believed at the time that we'd probably call him and tell him to pick it up early. 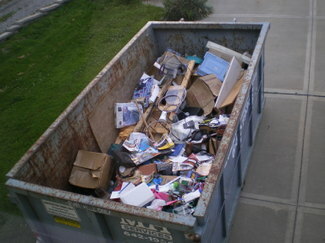 Right now it's a little more than half full and we still have plenty to discard. We're actually making pretty good progress, but we just have so much stuff that it's a challenge to put everything away even after we've separated the wheat from the chaff. Right now I'm hung up on the huge plastic tubs o' crap that have been hogging space in my office since November 2, 2006. Yeesh, it's even more embarrassing with a date attached. I managed to empty one of them, but the other is mostly files, junk mail and the occasional CD (Steve Miller's Greatest Hits! Natalie Imbruglia!). Everything is so jumbled that I have to look at one thing at a time and it's taking forever. Judging by the current state of my office, it's going to take several more days before I'm finished. When that day comes, though, I'm breaking out the champagne! I suppose it was mean of me to make my 77-year-old father come over and move junk out of my basement all afternoon yesterday. However, it did all belong to him and he left a good 50% of it behind. This is what my dad looked like when I was a kid. 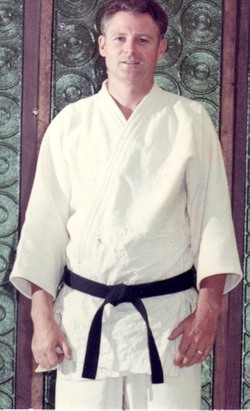 He owned a dojo back then, and he taught judo and competed in tournaments. We used to have hours of greenish Super-8 film footage of martial arts competitions shot in dim, fluorescent-lit gymnasiums. I've been so busy cleaning the house this weekend that I haven't secured a Father's Day gift yet. I'll make sure to add that to my agenda.